Neem Tree Dental Fleet Street is a dental practice located in Fleet Street, Central London where you can get treatments from fillings to fillers. Do you know how long I’ve been waiting for the moment that someone, anyone, would open somewhere down the road from my office so my aesthetic quest for perfection could be achieved in my lunch hour? Well, the time is finally here! I put Neem Tree to the test and arranged to go and try out an anti ageing injection treatment and, honestly, I’ve never been happier. You Got That Done at Neem Tree Dental Practice? Isn’t it a Dentists? Yes, in fact Neem Tree is, as it sounds from the name, a Dental Practice. They provide services from hygienist appointments to dental implants. However, along with regular dentistry, there are also cosmetic dentistry options available such as teeth whitening and veneers. And this is where Dr. Pamela Bonito comes in. Dr. Pam is an Aesthetic Doctor and Cosmetic Dentist and she is the one who also does the treatments such as anti ageing injections, chemical peels and fillers, amongst many others. I had no idea at the time but from checking out her Instagram page not only am I a fan of Dr. Pam, a lot of celebs love her too! As a quick explanation, Botox is a brand name, rather than a treatment name such as ‘lip fillers’. Somewhat how a Dyson is called a hoover, even though Hoover is actually a brand of vacuum cleaner. The specific name of the anti ageing injection I had was called Azzalure. It is manufactured by the French company Ipsen. It does exactly the same thing as the trademarked Botox product, it is simply a different brand. I was impressed that I was given this information and a leaflet about Azzalure. 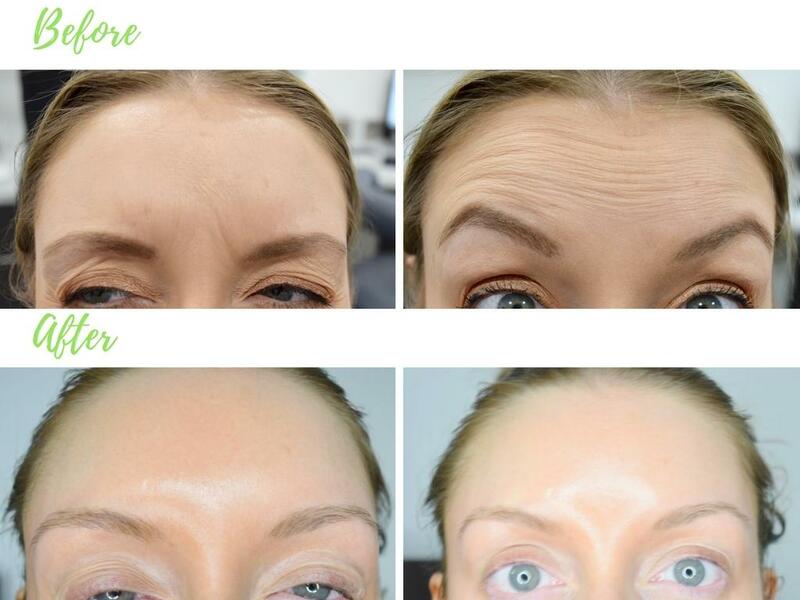 Normally you are not told what brand they are using or even if it is because they are using the branded Botox product, clinics don’t normally confirm. To date, I have had Botox about 8 times over the last 5 years usually alternating between frown lines or forehead when funds were low and having both areas done when I had the spare money. A couple of times I have had my laughter lines treated as well. I have always loved the results as I look far less angry when I can’t frown and my migraines reduce massively when the botox is in effect. Neem Tree Dental Practice is situated near Middle Temple on Fleet Street in London and handily for me, round the corner from the office. You fill in your consultation forms on an iPad whilst sat in a comfy chair, so even the most nervous of patients would be calmed by the environment and kind, friendly staff who offer some tea and coffee if you wish to have one. The reception and waiting area are designed to be vibrant, relaxing and peaceful, with light wood and neutral colours which give it a very chilled vibe. Each treatment room is well designed with top of the range equipment and the comfiest dental chair/beds I have ever sat on. I nearly fell asleep while having my forehead injected, that’s how cozy it was! The design of the rooms is very modern with exposed brickwork and clean lines. You can tell they have put a lot of effort into making a very stylish clinic which is a pleasure to go to. It is important to have a detailed consultation with your doctor. So before starting a treatment, Dr. Pamela gives you a full consultation so you are completely aware of what will happen, what the likely outcome will be, what aftercare you need to do or things you need to avoid doing and you go through exactly what you want. She will advise you of the side effects and risks involved, e.g. bruising, bleeding, droopy eyelids, wonky eyebrows, etc. You may have a medical condition which contraindicates Botox administration, e.g. pregnancy so you must ensure that you fill in your consent forms honestly. Dr. Pamela injected both the frown lines between my eyebrows and my forehead. You lay down on the bed and she assesses the muscles where she is injecting. Your face is cleansed and any makeup removed then disinfected, so it is sanitary for the treatment. You then frown or lift your eyebrows a few times so the best places to inject can be found. Each injection only lasts a couple of seconds and it feels like a tiny scratch. The needle is very fine and there is no pain at all. You can close your eyes and you don’t have to see the needle if you don’t want to. And that is it! You are then reminded of the most important things such as no gym, makeup, sauna, sun or sunbeds or sweating for 24 hours and no facial beauty treatments or massage for 2 weeks. It is explained how to cleanse your face gently that evening and you are taken to reception to book a follow-up appointment for 2 weeks time so an assessment of the treatment can be made and any changes made if need be. The effects should last between 3-6 months. I do find on me it does last the full 6 months normally so I expect this will be the same. The prices are clearly shown on their website here on the facial aesthetics page. I won’t put how much on here simply because this review will stay up into the future when presumably the prices will change and I don’t want it to be out of date. I loved my treatment with Dr. Pamela Bonito and just going to Neem Tree Fleet Street in general. Normally I spend my lunch break at work, still working, with lunch al desk-o. It felt like a treat going there as the staff were so friendly and couldn’t have been nicer to me. Dr. Pam is amazing at what she does and did a fabulous job. I absolutely plan to go back and get botox with her again when this wears off. The treatment was explained thoroughly and was quick and pain-free. The resulting look, which took about 10 days to settle in, was exactly what I wanted. My frown lines and forehead lines are totally gone and my eyebrows have a tiny lift which I prefer. There’s definitely less movement in my face, I actually can’t make creases on my forehead, but I can still move my eyebrows, which means I can form facial expressions and I don’t look frozen. Another benefit is that my skin is smoother which makes my makeup go on so much better. My favorite benefit, however, is that it has also helped with my migraines, which I get regularly when I don’t have botox. When I do they almost completely disappear. 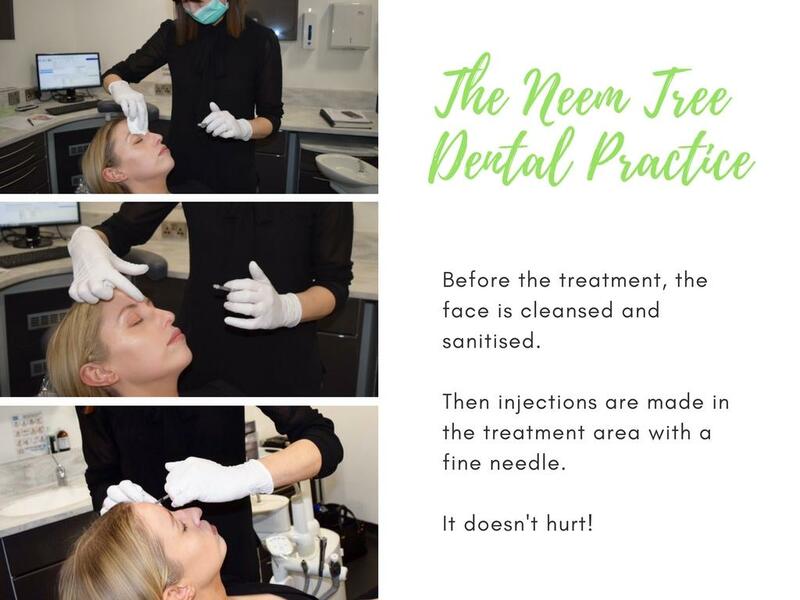 I felt totally relaxed and comfortable throughout my entire treatment at Neem Tree Fleet Street and I honestly recommend it there. For people like me, who work in London, it’s often hard to find somewhere near your office to get treatments like this done, as even travelling for a few miles during rush hour can take forever. 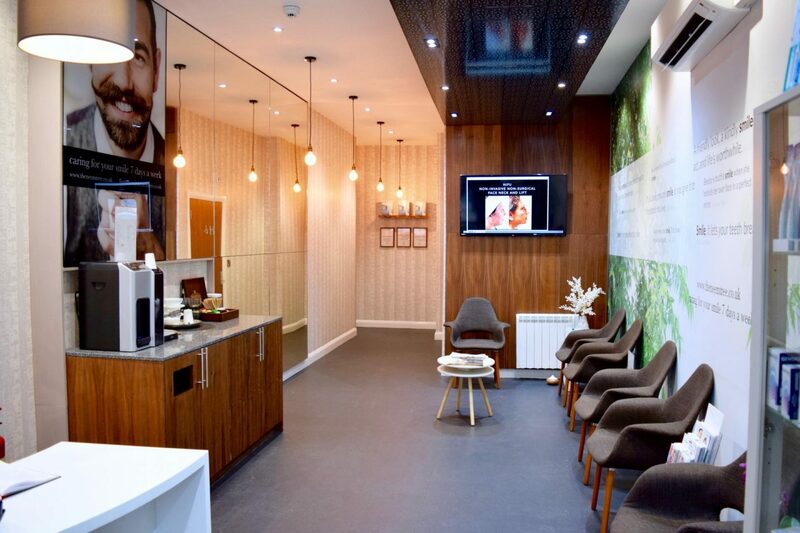 Neem Tree Dental Practice is in such a handy location for professionals working in London to not only get their dental needs met without having to travel far but to also get aesthetic treatments done. And if you don’t want anyone to know you get botox you can honestly say ‘I’m just off to the dentist’ if anyone at the office asks where you are going! The procedure was provided free in exchange for a review. Not paid for/sponsored. I booked a hygienist appointment while I was still there which is not a review treatment ie. I will pay for it. I think that itself shows that I honestly think it's a great place!